The Catoctin ridge extends from Western Maryland across the Potomac River into Virginia. Offering good exposure, excellent drainage and mountain breezes that offer protection from frost, the rocky slopes are ideal for growing grapes. With thirty years of experience in the mid Atlantic, owner-winegrower Dave Collins was well aware of these attributes when he selected the site for Big Cork Vineyards. Collins gained extensive regional experience across the river in Virginia and has come onto the Maryland viticultural scene as a major player and producer of fine wine. He started planting in 2011 and today has over 30 acres under vine. There are plans to plant five additional acres per year and top out at 60. Collins released his first vintage in 2013 and he currently produces something in the order of 5000 cases annually. I encountered my first Big Cork wine at the Maryland Winter Wine Showcase in 2016. Since that time, I have been talking about the wine and the winemaker, but I only recently found an opportunity to visit. Beforehand, I heard stories of a huge tasting room that emphasized the destination over the wine. I can tell you definitively that those rumors were false. It is indeed a beautiful tasting room, but what I discovered was a wine program seamlessly woven into the experience. Upon entering the tasting room visitors are greeted by a staff member. There is then a handoff to a wine steward, who is responsible for stepping visitors through the tasting roster. The program is informal but educational and it is perfectly executed. The staff is extremely well trained, professional and customer oriented. It is one of the most fully integrated winery experiences I have seen in the Eastern United States. As for the wines, I will say that I frequently visit tasting rooms throughout the Eastern United States and sample only one or two wines out of an entire lineup that I consider of real quality. At a good winery, I generally find between 75 and 80 percent of the wines to be exceptional. At Big Cork there was not a runt in the litter. I tasted ten wines and all of them were well crafted and medal worthy. I can’t say that never happens, but in my experience it is not the norm. I tasted a pair of Chardonnays. The reserve was just off the charts with ripe fruit and beautiful balance. Viognier can be tricky and often lacks enough acidity, but again the Big Cork example struck the right balance between rich peach notes and bright acidity. While the whites were uniformly well done, the reds were the real story for me. I am told that the Big Cork fruit has reached nearly California levels of ripeness during the last four growing seasons and it definitely shows. The Malbec is big and complex and easily the best I have tasted regionally. The Petit Verdot and Merlot were also off the charts, but the Cabernet Franc and Nebbiolo were standouts in a field of standouts. I am a sucker for a good Cab Franc and this one had a nose to get lost in. It was big and almost jammy with a long, long finish. You just have to see for yourself. The area north of the Potomac has an increasing number of bright spots. Big Cork Vineyards is definitely one of them and they have positioned themselves as a leader in changing perceptions of Maryland wine. The majority of visitors are from Maryland, DC, Pennsylvania and West Virginia. There is no reason why more traffic should not come from Virginia. The quality and price point are very competitive. The tasting room experience is one to be emulated. If you want to see what is possible north of the Potomac, I strongly recommend checking out this venue. When you do, please let me know what you think. Part of owner Voytek Fizyta’s justification for opening a winery was, he just “wanted to drink good wine.” It’s fair to say that Catoctin Breeze Vineyard near Frederick, Maryland has far exceeded that single expectation. With plans to open his winery, Fizyta purchased property on the eastern face of the Catoctin Mountains in 2004. With good exposure, orientation, drainage and cooling mountain breezes, the site was perfect for viticulture. In 2010, Fizyta began planting Syrah, Cabernet Franc, Chardonnay and Viognier. Additional vines were added incrementally. By the end of 2018 there will be eight acres under vine. Winemaker Mike Lentini lives just across the border in Pennsylvania and he has been with Catoctin Breeze since the beginning. Lentini is a skilled craftsman, who turns the estate fruit into world-class wine. Currently he turns out about 2000 cases annually and, when all of the vines mature, it is hoped that will increase to 3000 cases. The Catoctin Breeze wines are uniformly of the highest quality. I tasted several during my visit. Among the whites, I sampled a Viognier, a lovely Sauvignon Blanc and a pair of Chardonnays. The estate Chard was particularly impressive. Its balance, nice fruit and bright acidity made this offering stand out. It is a potential award winner. The reds included a very nice, medium bodied Cabernet Franc, a red blend and a stunning Syrah that took best in class at the Atlantic Seaboard competition. It is the Barbera, however, that requires specific mention. That grape is used by many wineries, but it is not often done well. The Catoctin Breeze example has great fruit, complexity and tannic structure. In short, this wine is just off the charts and was the highlight of the tasting. Wine is the main event, but not the entire story at Catoctin Breeze. The property, framed against the Catoctin Mountains, is absolutely stunning. The tasting room hosts live music on the weekends and a food truck on Friday evening. There is room for some smallish private events like a birthday party, bridal shower or corporate outing, but this is not a wedding venue. Located just minutes from Route 15 between Frederick and Gettysburg, this must-visit winery is easily accessible. So there are no excuses. You need to stop in and after you do, please let me know what you think. There are certainly people who are unaware that there are wineries in Maryland or even the east coast for that matter. For those who are aware, there are a handful of wineries that everyone seems to know. Knob Hall Winery is one of those. I encountered Knob Hall wines for the first time and Maryland’s Winter Wine Showcase, which is held each year in Baltimore. The best of the state’s wines are on display at that event. So this give some insight into the caliber of wines produced and it is an indicator that Knob Hall stands out regionally. The 170-acre Knob Hall estate is located in Maryland’s Western Mountain Region. The property is pressed up against the foothills of the Allegheny Mountains to the west and looking further east, there is a view of the remnants of the Blue Ridge Mountains. The property has traditionally been devoted to agriculture and grapes are the current cash crop. 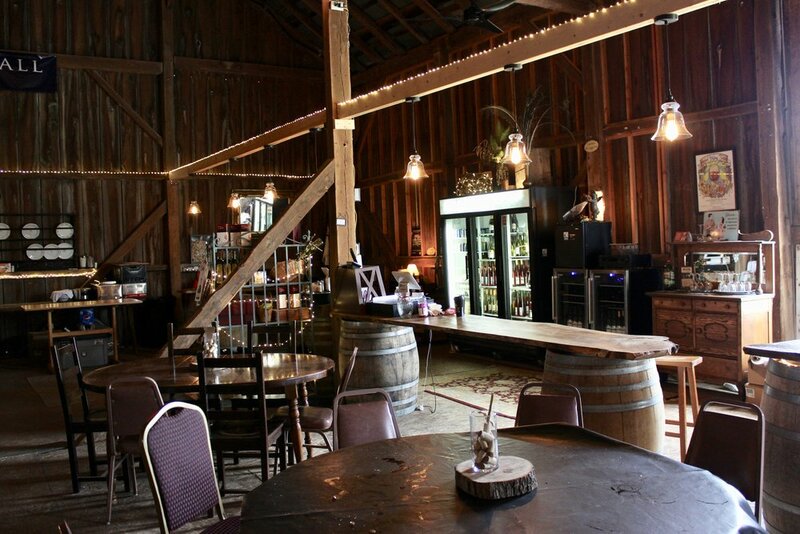 The tasting room is housed inside an old barn, which gives the operation a very rustic feel. It is spacious, however, with seating at one end and what appears to be event space at the other. I visited early in the day and crowds had just begun to form, but the tasting space appears to be adequate for the visitors that might make their way to the winery. Knob Hall has been on the scene a relatively short time. Richard and Mary Beth Seibert began planting in 2002 and today the 37 acres of estate fruit is used to produce between 3500 and 4000 cases of wine annually. The first harvest was in 2009 and the tasting room only opened in 2010. So in less than a decade the winery has established itself as a leading producer of world-class Maryland wine. Mary Beth is the winemaker and I tasted a half dozen of her wines during my visit to the tasting room. Among the whites there is a very nice Traminette and a Pinot Gris, but the Vidal Blanc was exceptional. Balance was a feature of all the wines, but I was taken by the Vidal’s citrus notes and bright acidity. I just found it to be a lovely, refreshing wine ideal for a food pairing. There were several standouts among the reds. I can point to the Chambourcin reserve as a great example of that varietal, but the Petit Verdot and Cuvee Josephine blend were off the charts. The blend was complex, but the Petit Verdot, with its beautiful nose, big dark fruit, firm tannins and a long finish, was my overall favorite. On the whole, however, the entire lineup was worthy of note. Katherine poured the wines and stepped me through the tasting. She had been with Knob Hall for about three years and possessed a depth of knowledge that made her an asset behind the tasting bar. As I observed the tasting staff in general, I found them to be attentive and customer oriented. Overall, Knob Hall deserves high marks for the tasting experience. Recommending Knob Hall Winery is a bit of a no brainer. This is an important Mid-Atlantic producer and anyone serious about exploring the region should certainly visit the tasting room and try the Knob Hall offerings. After you do, I am very interested in hearing more about your experience. Sat-Sun 12 to 5; Fri by appt. The Catoctin ridge originates in Maryland and extends south into Virginia. 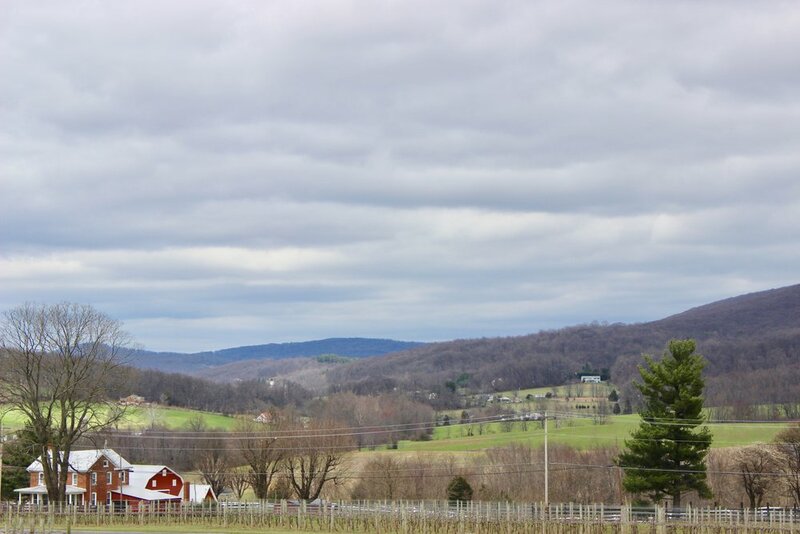 On either side of the Potomac the ridgeline contains dozens of excellent wineries. The rocky soil, drainage and exposure are ideal for viticulture. 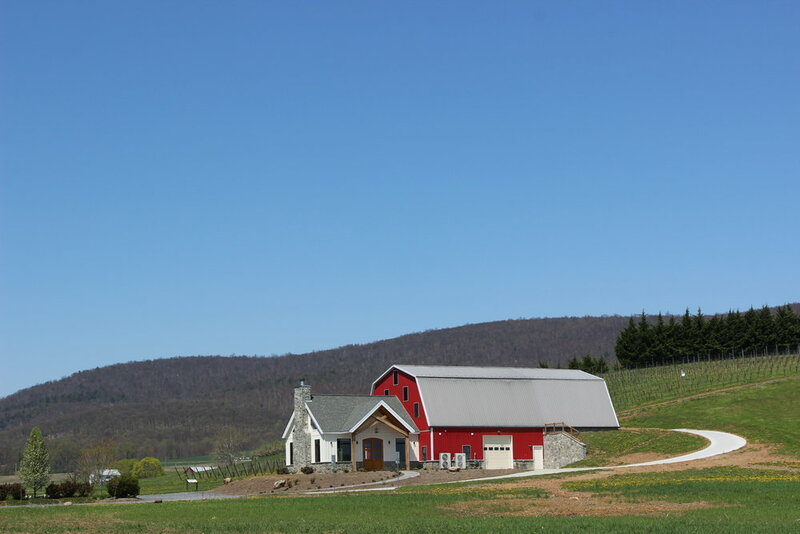 Red Heifer Winery is one of the Maryland producers taking advantage of the perfect terroir. 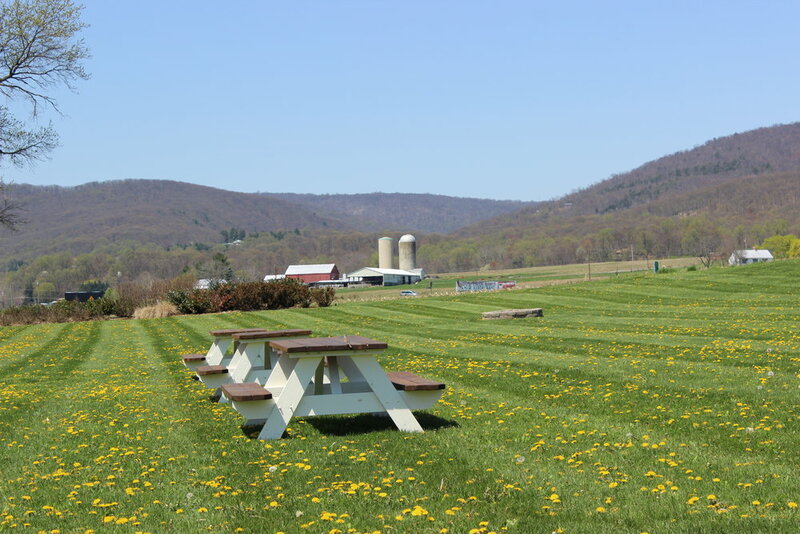 The vineyard and winery are located in a very rural section of the state that is famous for fruit production and Camp David (the presidential retreat that is located just south of Red Heifer). It is a lovely region and particularly so when the fruit trees are in bloom. Yvonne and Kevin Ford live on the farm that has been owned by the family since 1942. At 1500 feet, the property seemed ideal for viticulture, so the Ford’s planted three and one half acres in vines and opened their winery in 2012. Today, with another 12 acres under contract, the winery produces about 2500 cases annually. Kevin Ford is the winemaker. Despite being largely self-taught in the art of wine production, Kevin is making a lineup that is exceptionally well made. During my visit I was able to taste seven of his wines. Among the whites, there was a wonderful Chardonnay with excellent minerality, but Vidal Blanc was the standout. The green-apple tartness in this perfectly balanced wine makes it perfect for food pairing or as a wine to just enjoy by the glass on a warm spring day. I tasted a Catawba and a pair of well-crafted Chambourcins, but the Cabernet Franc was by far my top pick of the tasting. More than any other grape, I feel like Cab Franc expresses the nature of vineyard management. The Red Heifer example was the product of ripe, well-managed fruit. It was big and complex with beautiful black pepper notes in the finish. It is a great wine produced by a great winery. I must admit that I knew little about Red Heifer winery prior to my visit, but I came away a huge fan. This is a venue that should be added to your short list. If you are exploring Maryland wine or just looking for a great bottle from a quality producer, you need to stop by the tasting room. After you do, please let me know what you think.